Was this a bus journey or a guilt trip? I felt so disloyal and a little bit dirty as I clutched my new Tenmas multi ride bus ticket for use on those jolly green Titsa buses around Tenerife. Friends all leave you in the end, how fondly I remember sterling, pesatas, and those Zoom ice lollies with their three fruity flavours. But hey, I´m a modern man and not just ready to embrace change, I will even take it for a slap up dinner and declare my undying devotion if it does it´s intended job. For those unfamiliar with the public bus (or Gua Gua) and tram network in Tenerife, they have for years had a floppy multi ride card called a Bono that gives the holder around 30% discount on journeys. It was like a Willy Wonka golden ticket for me on my journeys around the island, so I was a little apprehensive when I heard of the new fangled Tenmas, contact less travel card. Initial thoughts of chaining myself to the railings of the Titsa head office soon subsided and this morning I purchased my reusuable plastic Tenmas card for 2 euros at a kiosk near the Los Cristianos bus station and got the seller to put a 10 euro top up on it. These credits can be added at 447 outlets around the island in multiples of 5 euros up to 100 euros. It´s also possible to get your photo added to your card, nudging the one off price to 5 euros, I felt it unfair to inflict my mush on the public so got a plain card. My 10 euro top up came with a 50 cents charge, I´m not sure if that is standard or fluctuates depending on how much you load up. The big push for the launch of the new cards was to get people to register at the on line site before the cut off date, 40,000 people quickly joined and this meant a free card was sent out to their homes. Now that period has passed, there is still a push to get people to register their card bought at one of the outlets around the island. Then special discounts and offers will be whizzing to you through cyber space, and you can top up online, and check your balance. One of the down points of the card is that unlike the Bono, your transactions are not printed on your card by the drivers machine. Tenmas has to be swiped when getting on, and validated again when getting off, and if you only use it rarely, you may well not remember how much credit you have left. As you validate your card when getting off, the reader does show your balance (saldo) so you could scribble it down, creating a marriage of convenience between old tech pen and paper and your new plastic friend. Like the nearly departed Bono (still useable until August 2018) you can still use your last bit of credit and pay the driver the difference at the discount rate. As I understand it, if you don´t validate your card on the way off, you will get automatically charged to the lines final destination, presumably after a time limit or at the end of the day. Drivers are still real human beings with their cheery smiles and snazzy green and grey uniform, so they will be able to nurse us through teething problems. 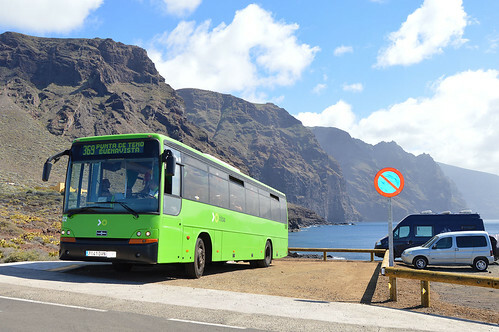 While we are on the subject, Titsa have just celebrated 40 years and committed to spending 17 million euros on 74 new buses for Tenerife. This could be the biggest revolution since they changed from their original red buses, I can feel a new era of random bus journeys calling out to me. My new plastic card is going to clock up some serious kms. Pop by again soon and I will be explaining how to split the atom. Yes you are correct. If you dont validate card on exit you are charged to the final destination point. Validation does not always work. Maybe because new technology? We go to Tenerife for 6 months in winter and this April brought back a new €25 bono bus card plus a bit left on an another one in readiness for our next visit later this year. As they are no longer available from August 2018 do you know if we can get a refund on the €25 one ? I´m not sure but they were always good with replacing damaged Bono tickets and amalgamating odd left over amounts onto a new ticket. You would need to go into the Adeje-Las Americas station-worth a go. This new update from TITSA. 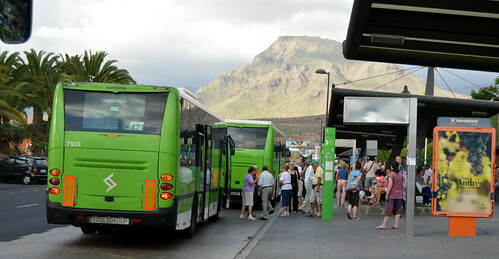 Multi ride Bono bus tickets ceased to be sold a couple of months ago as the new rechargeable Ten Mas option became the ticket to ride the TITSA public service green buses in Tenerife. Both systems are operating at the moment but as from 3rd September 2018, the Bono cards wont be accepted BUT you can transfer any outstanding balances from up to four Bono cards to the new plastic Ten Mas tickets until 31st October 2018. This covers all Bono tickets bought since January 2017 (yes 2017) if you haven’t already got a Ten Mas ticket, it costs a one off payment of 2 euros. You will need to do this in person at the TITSA office at the main bus stations around the island, look out for the poster at the offices. Can you use your tenmas card on the other islands? Not sure if I am getting the same discounts as the bono card. Was charged 1.35 on the onward journey on the bono card and 1.65 on the way back, same route and validated on exit. Can I buy a tenmas card at the Tenerife South airport? Do you still get the same discounts as you did with the Bono card? Many thanks. 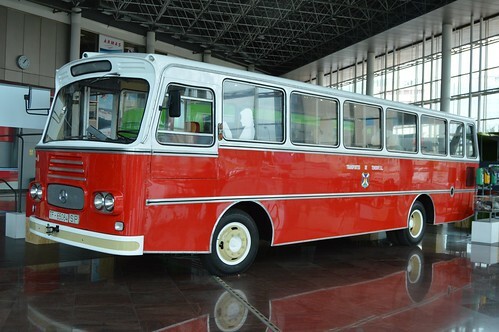 I just checked the Titsa bus company listing. The South Airport has Tenmas, the discounts are pretty much the same as on the old Bono. Hi Colin, just found you very good info. Do you still get the new tenmas card at the same location in TFS? Hi Neville, thanks for your interest. Not sure about the location in TFS, but there should be stickers on the outlets and staff are very helpful. Thanks for that update, good to know the system works – that´s a good deal. Hello Colin, can you get a refund on any unused credit on your Tenmas card at the end of your stay, as you can on a London Oyster card? We are coming for 5 days over New Year, and it will be difficult to calculate exactly how much credit we need. I was told No at their Santa Cruz office. But they can be used for several people and some places do a 5 euro top up. Two of us travelling. Do we need a Tenmas each? One ticket will cover both of you. Have fun. How does Tenmas work when you want to click two or more people onto a bus? Do you ask the driver to put the number of people through? And what do you then do when getting off the bus – do you click the card off once, or once for every person clicked on?! Or don’t you need to click it all (as I read on another website)? Sadly the TITSA website gives no info on this! Show the driver you want it for 2 people and double swipe, then same amount again when getting off, or it will charge for one journey to the end of that route. The little display will flash up Saldo (balance). Coming on holiday next week. Can I buy new Tenmas card in Los Gigantes? Yes, at the supermarket in Los Gigantes. 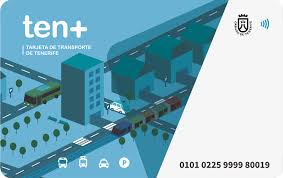 Hi, do you know how the ten plus card works for transfer journeys eg Candelaria- Santa Cruz/ transfer/Santa Cruz- Puerto de la Cruz . Does one fare cover the journey and if so how does it work with validation etc. You have to swipe the card when you get off a bus and swipe on again for the next journey. It´s a very rushed thing as you get off the bus, especially when there are many people getting off. Swiping the card can hold things up and if you want to query anything with the driver you have to push your way back down the bus. Its a good system but you cant beat the human touch. I have been told that the credit on a Tenmas card expires after 12 months if there have been no top ups during that period. Does anyone know if this is correct. Just checked. The card is still valid but any of the bonus points for offers will have expired.